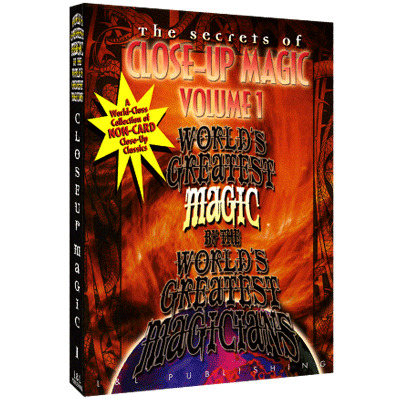 On this DVD, you'll meet seven different performers presenting and teaching powerful close-up routines that will wow any audience - and there's not a playing card in sight! The legendary Bruce Cervon starts off with a beautifully routined piece of magic where a borrowed handkerchief is clearly seen to be burned, magically repaired and then used for a stunning production. Glen Falkenstein, of the famed mentalism team of Falkenstein & Willard, combines two simple and well-known dealer items to create a beautiful hybrid of magic, while Michael Ammar gives you all of the work on Stefan Schutzer's wonderful animated bill effect. Bob Read is next with a hilarious routine that will make you sorry you laughed so hard because you will be badly fooled by the trick's end. Mark Leveridge offers an elegant and very magical coin box routine, while Flip brings the mystery of the classic linking rings to a few safety pins. Finally, Bill Malone performs and teaches a wonderful (and wonderfully portable!) Cups and Balls routine that will charm young and old alike. 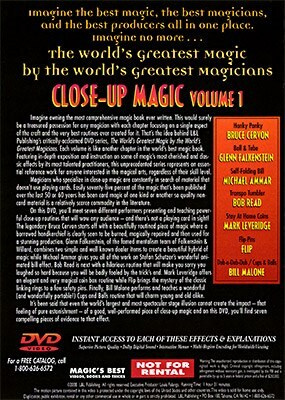 It's been said that even the world's largest and most spectacular stage illusion cannot create the impact - that feeling of pure astonishment - of a good, well-performed piece of close-up magic, and on this DVD you'll find seven compelling pieces of evidence to that effect.